Q’eswachaca, spans 118 feet and hangs 60 feet above the canyon’s rushing river. 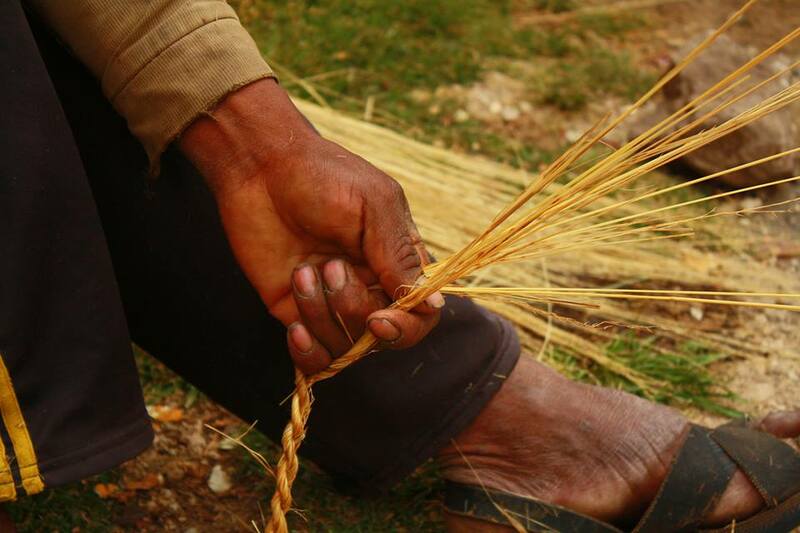 the Inca Rope Bridge Queswachaka Day Trip , is a fully day trip from Cusco that allows our customers to become immersed into the high Andes to get Qeswachaka. After an early morning departure from Cusco our vehicle transfer us through an amazing landscapes and lagoons and begin our trip, Inca Rope Bridge Queswachaka Day Trip, lays peacefully at the base of the Apurimac River (God spoke) and is one of the most stunning places in the Cusco Region to do rafting. Our Guests enjoyed Inca Rope Bridge Queswachaka Day Trip, by 3 hours driving toward the three lagoons, Quechua-speaking Inca descendants, We then make our way back for a lunch. prior to our departure from Q’eswachaka a quite landscape. after, we meet our private convoy that will take us back to Cusco, where we expect to arrive after twilight. Inca Rope Bridge Queswachaka Day Trip , the hand woven Inca Rope bridge is located over the River and crosses Apurimac Canyon in Peru. builded by four Quechua ethnic groups. 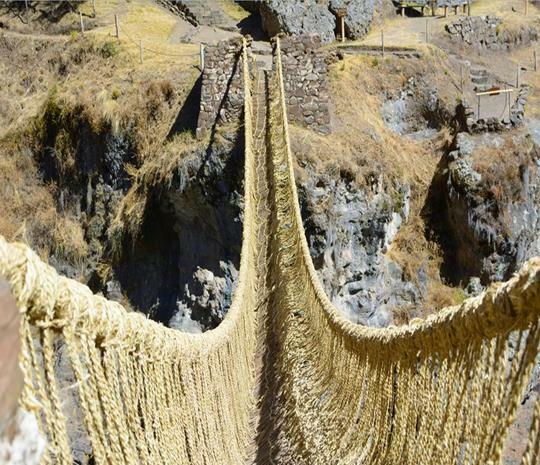 The bridge were an integral part of the Qhapaq Ñan (Inca road system) and exemplify Inca innovation in engineering. 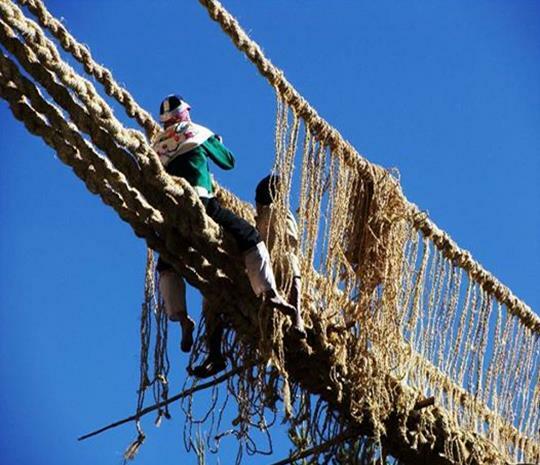 Bridges of this type were useful since the Quechuas did not use wheeled transport, Inca Rope Bridge Day trip, shows you a great knowledge of the Quechua people in terms of engineering as well as the hidden wonders of Cusco. 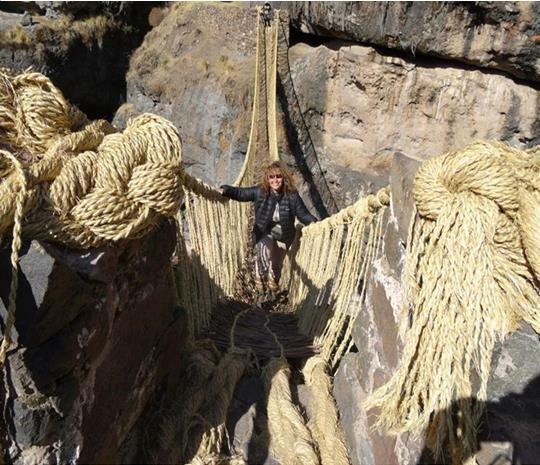 Inca Rope Bridge Queswachaka Day Trip, would be a great inclusion in your Peru vacation! We leave Cusco very early in the morning from your Accommodation, adjust to its altitude by exploring through the Vilcanota Mountain Range, We start 6:00 in our private vehicle driving through small villages, southern site of Cusco, arriving then to 4 lagoons (3700M, 12139,11Ft) (Pomacanchi, Aqopia, Pampamarka and Asnacocha , a short drive takes us to Pabellones Volcano (1 m.size), Q’eswachaka (3799M,12139,11Ft ), on our way back our lunch spot then toward Karañawi cave, the natural moulding rocks into the cave and our conboy return us to Cusco around 6:00 p.m; We drop you at your hotel.